Audi is making a strong statement with the new S8 plus. With a power output of 445 kW (605 hp) and a top speed of up to 305 km/h (189.5 mph), the new Audi S8 plus delivers even more enhanced driving performance. The new top model is reinforcing the brand ’s position in the segment of premium class sedans. 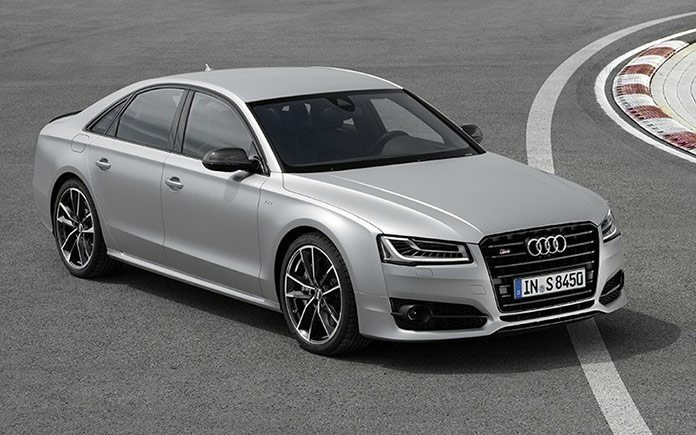 Audi engineers have further advanced the development of the 4.0 TFSI engine for the new S8 plus. The sonorous V8 biturbo engine now has a power output of 445 kW (605 hp) and a maximum torque of 700 Nm (516.3 lb-ft); in overboost mode, it can even produce 750 Nm (553.2 lb-ft). The large sport sedan – whose power was boosted 63 kW (85 hp) compared to the S8 – accelerates from 0 to 100 km/h (62.1 mph) in 3.8 seconds, and its governed top speed of 250 km/h (155.3 mph) can optionally be increased to 305 km/h (189.5 mph). 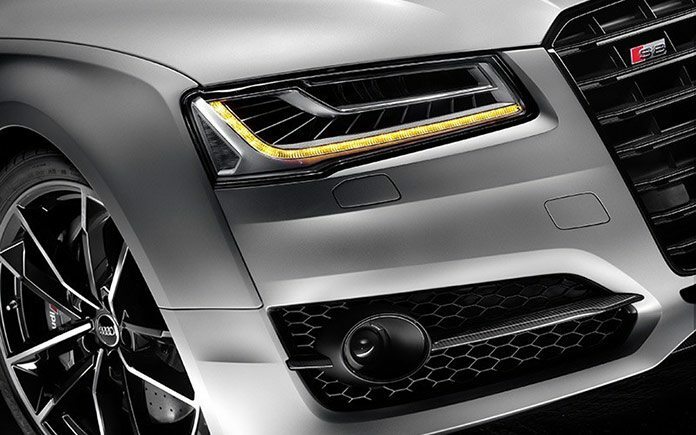 An eight-speed tiptronic distributes the forces that are generated by the power- boosted V8 engine to a quattro drivetrain with a sport differential. Chassis highlights include the adaptive air suspension sport and dynamic steering, both of which chassis experts tuned specifically for the S8 plus. 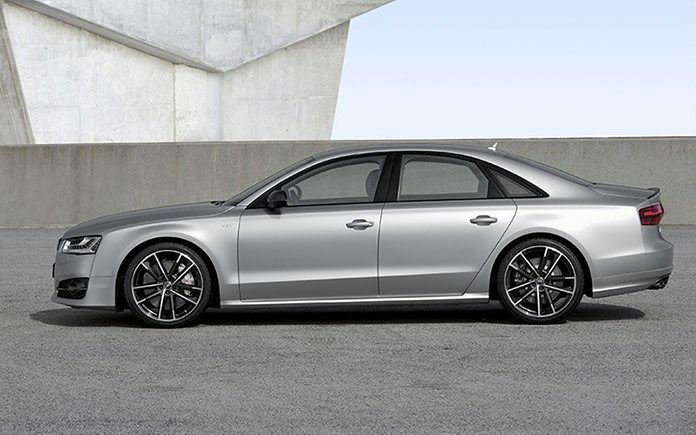 In Germany, the car comes with 21-inch wheels that were specially designed for the S8 plus and size 275/35 tires. 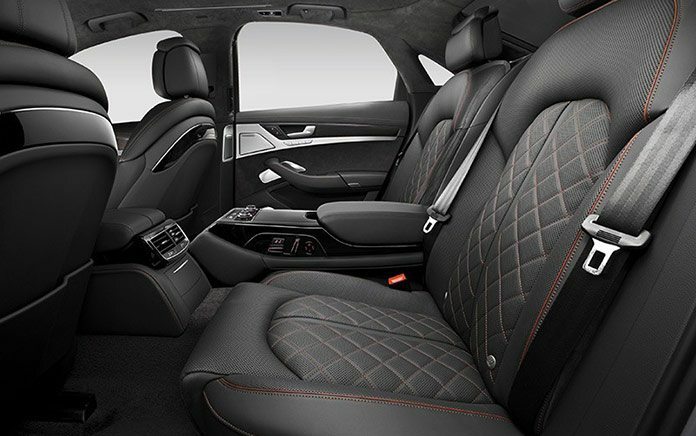 The new Audi S8 plus reveals its position as the sportiest top model of the model series in its design detailing. The standard spoiler lip on the rear lid catches the eye. It is painted in the exterior body color, and it is also available in carbon fiber as an option. The flaps in the side air inlets and the blade on the front apron are made of carbon fiber. Audi S8 plus also include darkened tail lights and a gloss black diffuser insert, which has an additional carbon surround. The dual-branch sport exhaust system branches into two oval gloss black tailpipes on the left and right. 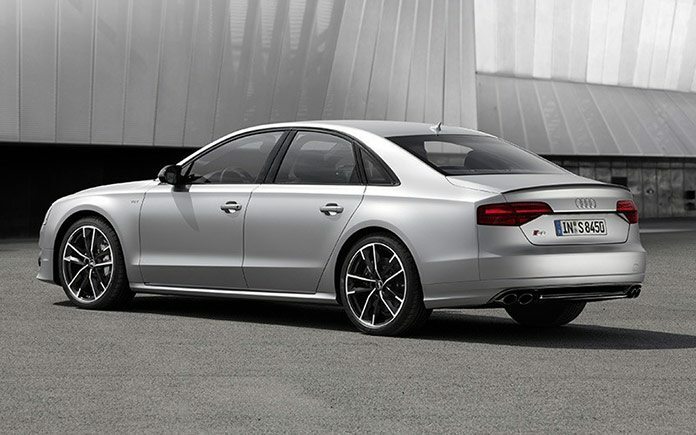 As an alternative, customers can choose the S8 styling package. 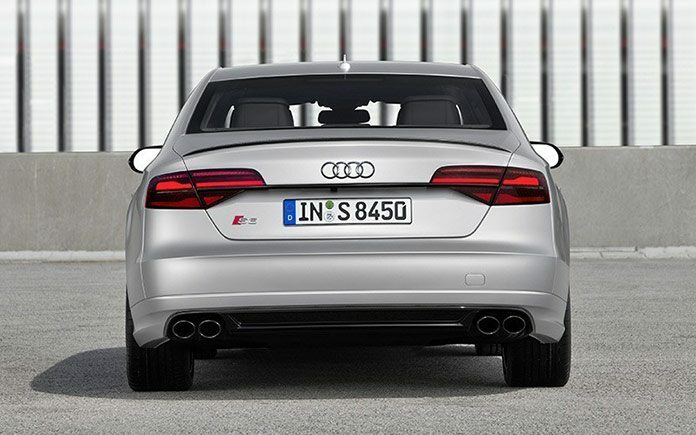 It features S8 logos at the front and rear and V8 T badges on the front fenders. 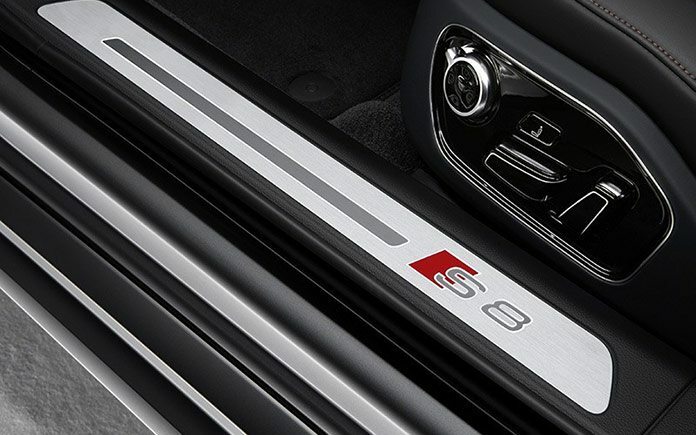 The matt-effect paint finish floret silver is exclusively available on the S8 plus. All of the colors offered on the Audi S8 are also available on the S8 plus. Audi delivers the new S8 plus with the normal wheelbase and offers extensive standard features that include ambient lighting, a convenience key with sensor-driven luggage compartment locking, full-leather interior package, Alcantara package, power-assisted door closing and a DVD/CD changer. 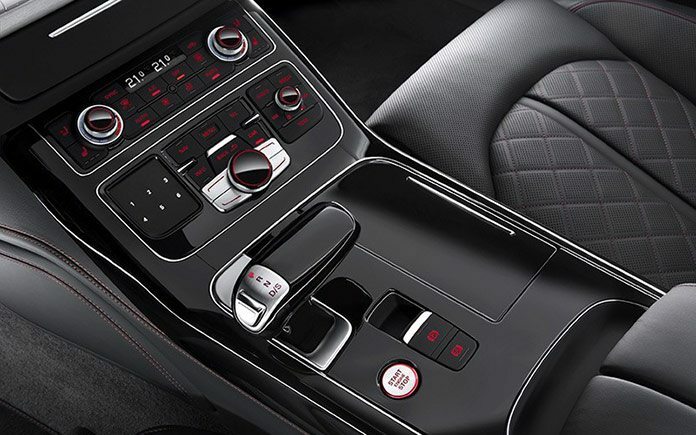 In Germany, standard features – in addition to the dynamic package – also include the assistance package with Audi pre sense plus, four- zone deluxe automatic air conditioning system, Bose surround sound system and MMI navigation plus with MMI touch. 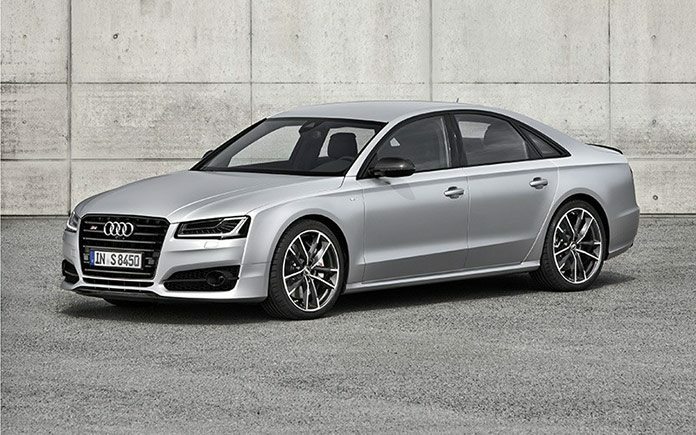 The new Audi S8 plus will be available at the end of November for a base price of 145,200 euros.